The RP Photonics Buyer's Guide contains 32 suppliers for achromatic optics. Achromatic optics are optical devices or setups which have been optimized such that chromatic aberrations are minimized, such that they can be used in a wide range of wavelengths. Most frequently, this refers to optical lenses or objectives, which are essentially combinations of several lenses. Achromatic optical lenses are often just called achromats. The property of being achromatic (essentially insensitive to wavelength changes) is called achromatism. Achromatic optics, in particular doublet and triplet achromatic lenses, have been invented and used already in the eighteenth century. As the article on chromatic aberrations explains, frequently used parameters are based on refractive index values at certain reference wavelengths. From these, one calculates Abbe numbers such as VD or Vd, which then appear in various formulas for calculating the strength of chromatic aberrations. Such equations allow one to calculate parameter combinations (e.g., concerning used materials, curvature radii and spacings between optical elements) for which the axial and/or transverse chromatic aberrations vanish, typically at two or three different wavelengths. Simple singlet lenses are not achromatic, i.e., they exhibit substantial chromatic aberrations. As an example, we consider chromatic aberrations of a lens. A first simple version is a biconvex singlet lens made from BK7 glass, with curvature radii of 103 mm on both surfaces. The substantial chromatic aberrations of that lens are demonstrated in Figure 1, where it has been assumed that a collimated laser beam with an initial beam radius of 1 mm hits that lens. Obviously, the focus position has a substantial wavelength dependence. Figure 2: Design of an achromatic lens doublet. The left part is made from a crown glass, and the right one from a flint glass. For improving the situation, we can now use an achromatic lens doublet, consisting two parts (see Figure 2): a biconvex lens made of BK7 and concave-convex lens made of SF2 (a flint glass). The basic idea is to realize an overall focusing lens by combining a strongly focusing and a less strongly defocusing lens, where the latter exhibits stronger chromatic dispersion. Although the defocusing effect of the second lens is weaker than the focusing effect on the first one, its chromatic aberrations can compensate those of the other lens. The considered doublet lens design has been numerically optimized such that we obtain a focal length close to 100 mm (measured from the middle of the lens at z = 2 mm) in the wavelength range from 400 nm to 800 nm. The curvature radius on the left side has been fixed at 60 mm, and the other two curvature radii were subject to optimization. The inner radii of curvature of the two lenses are required to be the same, so that the two lenses can be contacted (e.g. cemented together), forming a single optical element and minimizing reflection losses. Note that for the given focal length the double lens requires a stronger curvature due to the defocusing effect of the flint lens. Figure 3 shows the resulting foci; one can see that the focus positions agree quite well for three very different wavelengths. Figure 3: The foci after an achromatic lens. The focus positions of three substantially different wavelengths are quite similar. The calculation has been done with the RP Resonator software. 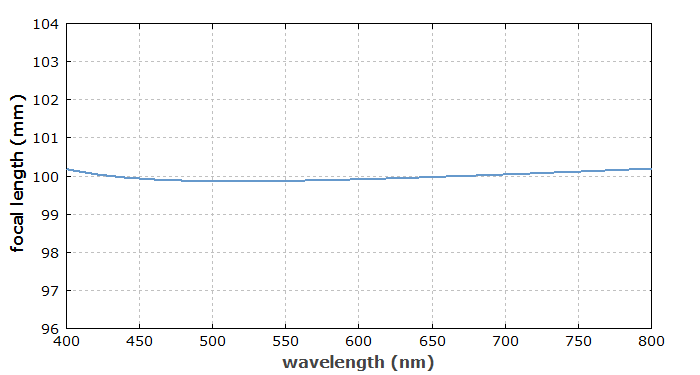 Figure 4 shows the residual wavelength dependence of the focal length. One can see that the chromatic compensation is good but not not perfect. Figure 4: Wavelength dependence of the focal length of the achromatic lens. There is a variety of achromatic lens designs. Other doublet lens designs are flat on one side (plano-concave designs), and one can also realize defocusing achromatic lenses (negative achromats). In some cases, a lens doublet is not contacted, but the two lenses are only placed in a common housing (air-spaced doublets). Furthermore, there are cylindrical lenses designed as achromats. With such a doublet lens design, one can adjust the parameters such that the axial chromatic aberrations exactly vanish for two wavelengths (typically in the red and blue spectral region). By combining three different materials (making aspheric triplets), it is possible to make a so-called apochromatic lens (apochromat), where the chromatic aberrations vanish for three different wavelengths. Although in principle the distortions at other wavelengths are not limited by such conditions, they are typically smaller for an apochromat at least within a certain wavelength range. In the same way as other lenses, achromats can be optimized for additional requirements such as minimizing spherical aberrations and coma in certain situations, and can be equipped with anti-reflection coatings. Also, there are mounted and unmounted achromats. 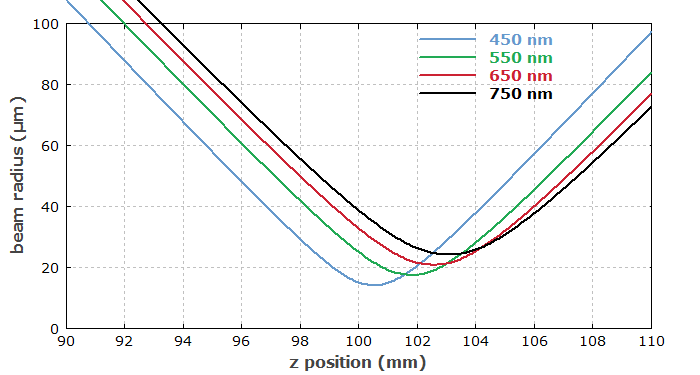 Particularly high performance in terms of the magnitude of remaining chromatic aberrations can be achieved with superachromatic lens designs, involving fluoride glasses and requiring particularly tight fabrication tolerances. There are also other types of achromatic lenses, which are based on diffractive optics. Here, the operation principle is entirely different from that of the lens doublets as explained above. There are achromatic optical prisms where the deflection angle hardly depends on the optical wavelength. Optical prisms are often used for obtaining a wavelength-dependent deflection angle for the light beam. In some cases, however, it is desirable to obtain a certain deflection angle which is about the same for a wide range of wavelengths. Such a performance can be achieved with essentially the same basic approach as for an achromatic lens doublet: one can combine two prisms made from different optical materials, which may be contacted to obtain a single prism. It is also possible to design composite prisms such that the average deflection angle in some wavelength range is about zero, but a substantial wavelength dependence of that angle is achieved. That is of course not an achromatic design. There are also achromatic waveplates, but in this context a different kind of chromatic distortion is reduced: the wavelength dependence of the optical retardance, i.e., of the difference of the optical phase changes caused for two orthogonal polarization directions. Such devices can be made by combining materials with different chromatic dispersion (e.g. quartz and MgF2), which can have a nearly constant retardance over a very wide spectral range (hundreds of nanometers). Imaging is the most important application sector for achromatic optics. The main application of achromatic optics (in particular, on a chromatic lenses) is in imaging systems, as needed for photography, microscopy and video recording, for example. In many cases, it is not sufficient to use a simple doublet lens; instead, one requires a more complex objective, containing multiple lenses. The typical approach for compensating the chromatic aberrations of such a system is not to build it from achromats only, but rather to find an optical design where only the over all chromatic aberrations are more or less compensated. Of course, chromatic aberrations are typically only one of several types of distortions which need to be minimized, and additional requirements such as a compact design or highlight throughput can make it even more difficult to find a good compromise between all requirements. When very broadband light or light with very different wavelengths components has to be focused or collimated, one often requires achromatic optics. Achromatic optics are not only required in the visible spectral region, but also for infrared and ultraviolet light. Particularly strong dispersion is to be compensated in the ultraviolet spectral region, but there are also applications in the infrared where two or more very different wavelengths or a very wide range of wavelengths are involved. For example, achromats are beneficial for focusing or collimating the output of supercontinuum sources or in other cases with ultrabroadband ultrashort pulses. In some applications, it is possible to avoid any chromatic aberrations by using reflective optics instead of lenses. Curved mirrors, which can be used for focusing a beam, for example, are naturally achromatic; this applies even to dielectric mirrors, despite the wavelength dependence of the used multilayer materials.